Hence, when I was approached to do a food and beer pairing event at my Dad's pub, The Royal Oak, as part of Tunbridge Wells Beer Week, I immediately settled on tacos as the dish I wanted to serve. Today, I'm pleased to officially announce my first ever event under the Beeson On Beer brand: Let’s taco ‘bout beer - A tutored tasting with James Beeson. The event will take place at The Royal Oak in Tunbridge Wells on Saturday 15th September at 2pm. Tickets are priced at £15 and include three tacos, each paired with a different style of beer from some of the UK's finest breweries. I shall be revealing the pairings in due course, but rest assured that we're working on some absolute treats for you guys to enjoy. 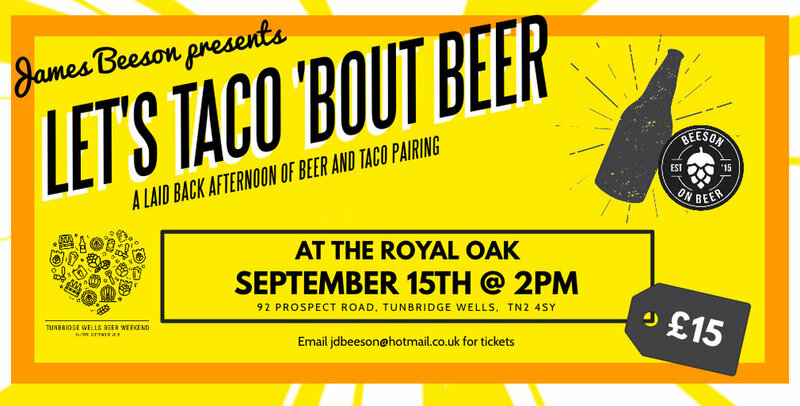 If you'd like to join me for a laid back afternoon of beer and tacos, you can purchase your ticket online here or visit bar staff at The Royal Oak. I look forward to hopefully seeing some of you there! Please note: this event is not suitable for vegetarians or those with fish or lactose allergies.